Played some major dress up today, so major in fact, that I really didn't leave the house once. (Hermit, anyone?) But it really got me thinking, when was the last time I let myself do this? When I was six? Eight? Last week? Ha, perhaps I need to make this a habit. I rediscovered some great finds in the depths of my closet that I've reworked a bit for this week's Weardrobe contest, Mellow Yellow. These are some of my submissions. Cross your fingers for me. Mama needs a $50 gift certificate to Anthropologie. oh my goodness, look how adorable you are! i love all of your outfits here. i haven't not been able to pull a contest outfit together in time even once! haha. good luck! p.s. you've got me hooked on CR (cough) accessories. haha. i love them all! 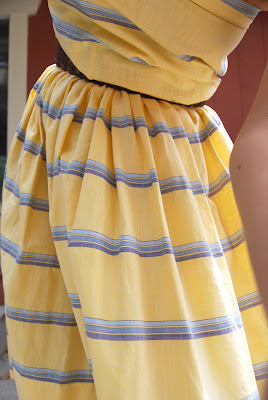 i especially like the yellow DIY dress! congratulations! i just popped over to weardrobe and guess who was on the front page!! how exciting.